3D Connexion is a division of Logitech, the company that makes all kinds of peripherals for the PC. Chances are you are using one of those right now. If you are unfamiliar with a 3D Connexion controller, think of it as a 3D mouse. Ok, that probably doesn't help, so check out this video. Most CAD applications, Sketchup and otherwise have used a combination of mouse and keyboard commands to get you around in 3D space for years. This is a bit like driving a car with a manual transmission using one arm. You can do it, but it's not a particularly smooth ride. There are several different models of the controller, this one just has the basic 3D cap. The bigger models are adorned with buttons that can be mapped to all kinds of shortcuts. 3D Connexion has announced a challenge: They want anyone to design a new controller. It can be any size and shape that you want, as long as it has the 3D cap on it. This is your chance to come up with the latest and greatest 3D controller. What do you get in return for your troubles? 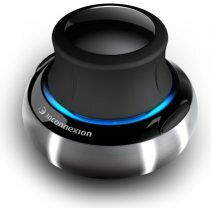 You can win one of three of the 3D Connexion controllers, and the grand prize is a mind bendingly fast CAD workstation from BOXX. Click this link to see all the details. So check it out, I think this is a really cool contest. If you have any submissions, please send them my way, I'd love to feature them here on the blog!